What is a Precision Rectifier? The precision rectifier or super diode is an arrangement achieved with one or more op-amps (operational amplifiers) in order to have a circuit perform like a rectifier and an ideal diode. Circuit designers have two standard methods for designing a precision rectifier. They can amplify the AC signal and then rectify it, or they can do both at once with a single operational amplifier. The latter method is often considered a much better way to get the job done. The fundamental circuit of the precision rectifier is shown below. When the voltage given this circuit is negative, then there will be a negative voltage on the diode. So this circuit works like an open circuit. It means there is no flow of current in the load, as well as output voltage, is zero. When the input is positive, it is improved by the op-amp, which activates the diode and there will be a flow of current through the load, because of the response, the output voltage is equivalent to the input voltage. The super diode’s actual threshold is very near to zero. It equivalents the actual threshold of the diode, separated by the operational amplifier gain. This fundamental circuit has a problem, so it is not used frequently. When the input turns into –ve the op-amp runs open-loop, as there is no response signal through the diode. For a typical op-amp with high open-loop gain, the output overflows. If the i/p then becomes +ve again, the op-amp has to leave from the saturated state before +ve amplification can take place again. This transform generates ring and acquires some time, very much reducing the frequency reaction of the circuit. Another version of the precision rectifier is shown below. In this case, when the input is superior to zero, the D1 diode is off, and D2 diode is on, so the o/p is zero because one side of R2 is connected to the virtual GND, and there is no flow of current through it. When the input is less than zero, diode D1 is on, and D2 diode is off. So the o/p is like the i/p with an enlargement of -R2/R1. 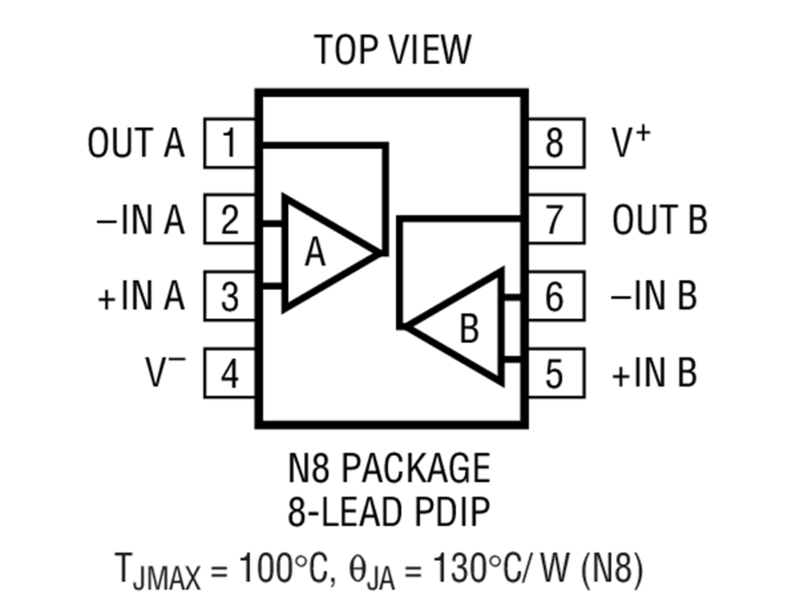 The main advantage of this circuit is, that the op-amp never goes into saturation but its output has to vary by two diode voltage drops each time the i/p signal crosses zero. Thus, the slew rate of the op-amp and its frequency response will limit high-frequency act, particularly for low signal levels, though a fault of less than 1% at 100 kHz is possible. 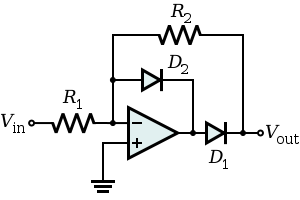 Similar circuitry can be used to make an accuracy full-wave rectifier circuit. The LT1078 is a micropower dual operational amplifier; it is obtainable in 8-pin packages including the little outline plane mount package. It is raised for single supply function at 5V. ±15V conditions are also offered. The features of LT1078 include the following. The applications of LT1078 include a battery, portable instruments, remote sensor amplifier, satellite, micropower sample and hold, thermocouple amplifier, and micro power filters. The precision rectifier using LT1078 circuit is shown above. 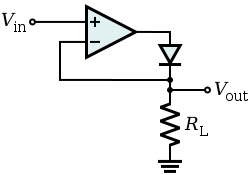 The first section of negative i/ps operates as a closed-loop inverter (A=-1) and the second section is just a buffer for the positive o/p. When the i/p signal is +ve, then the output of first op-amp remains saturated near GND, and the diode turn into high-impedance, letting the signal to flow straight to the buffer stage non-inverted. The complex result is a full-wave rectified waveform at the output of the buffer. Thus, this is all about precision rectifier using LT1078. Furthermore, any queries in implementing the engineering projects, please give your feedback by commenting in the comment section below. Here is a question for you, what is the function of LT1078?